A customer, who is the intermediate party between the governement and organisation working in a specific sector wants to use Microsoft Teams as the preferred way of communicating with those organisations. They are planning to use a Teams for HR, Communications, IT and other common fields that sector wants support in. The intermediate party only has a handful of users and wants to leave the management of the Teams to external experts. Because it isn’t possible to use the externals own Office 365 license for this tenant (because they appear as a guest, who can’t own a Teams team), they were looking for the cheapest subscription that would get the externals licensed as an owner. With the new F1 license (for frontline workers, costing 3,4€ per month per user in Belgium), let’s see what you get for it. A lot, it turns out!! So what do we get in this F1 license? 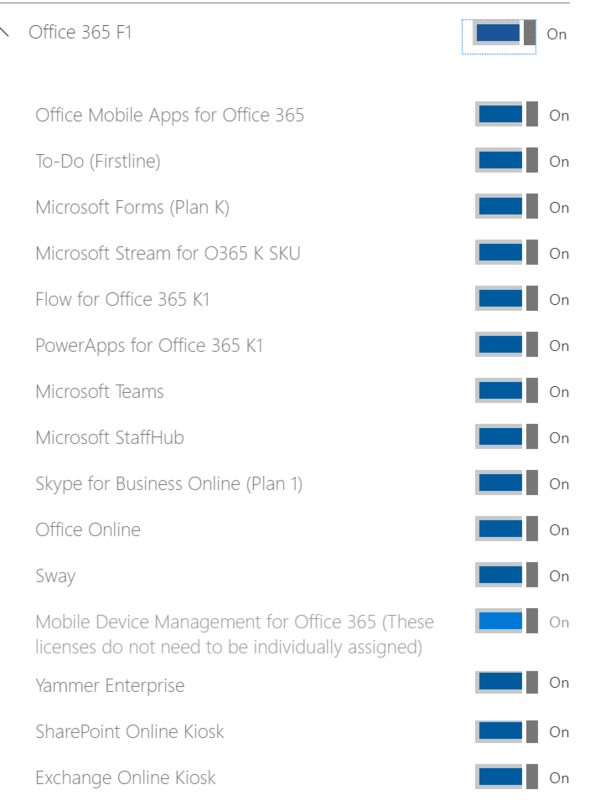 A full Teams experience, Office online (which gets you very far), Flow and PowerApp and a bunch of other services like To-Do and Sway. At a pricepoint which is half of an E1 license this is a big benefit. So what is the catch? Well, first.. the OneDrive license will only cover up 2 GB.. not the 1TB that you get with an E type license. Same thing goes for Outlook, while on E types you get an unlimited mailbox, for F1 users this is limited to 2GB on the mailbox, attachments up to 150 MB. F1 licensed users can also create SharePoint sites and Groups. A big difference to note is Skype For Business. In this case we don’t want SfB, but to use Teams. What is different here? You can do your chat, video and audio calling. You get all the activity info as well. When it comes to Teams, you can be the owner and everything that goes on with that.. create channels, member management and such. Meet Now functionality also works, but with a twist.. You can’t record the meetings! Same thing for the calendar. No option here to create new meetings or Live Events.. this is reserved for E3 or E5 licenses. You can however be invited to be the presenter or producer, but some one else needs to set up the Live Event. only the “me” page is visible, no documents and no “home”. So is the F1 license enough for my external owners? F1 can be enough for your owners, if you don’t want to record meetings or let your owners create Live Events.